It is estimated that there are around 100,000 street cats in the Puerto Vallarta area who need a loving home. In ancient Egypt, cats were elevated to objects of worship, but today many are relegated to dark street corners and abandoned buildings. Thousands are born only to quickly die. At any time Puerto Vallarta residents and visitors can witness kittens being thrown into garbage pick up areas or along the river or skinny street cats fighting over scraps of food. It is estimated that there are around 100,000 street cats in the Puerto Vallarta area. Any domesticated animal such as a pigeon, pig, horse, dog, or cat, who lives away from human contact can revert to a wild state. These animals are called "feral." Feral kittens are the offspring of a feral mother cat, or they could be born to a domestic mother who has become lost or was abandoned, or chooses to have her litter away from humans. In order for kittens to become friendly and completely domesticated, they should be handled from a very early age, before they are two weeks old. Feral mother cats teach their young offspring to be wary of humans and to run and hide if they feel threatened. Young kittens, who have not been handled by humans, will spit or hiss when you approach them. Older feral kittens will be wary of humans and flee when approached. A stray domestic cat, who has had to survive on her own for a while will initially be wary of humans. However, she will regain her confidence fairly soon after re-establishing contact. There are varying degrees of wariness and shyness among both ferals and other cats, who have been abandoned to fend for themselves. It requires a certain amount of experience working with stray and feral cats to be able to properly judge just how feral a cat may be, or if the cat is feral at all, or just a frightened domestic cat. Many domestic cats are killed merely for acting fearful and defensive in a frightening situation-assumed to be feral. 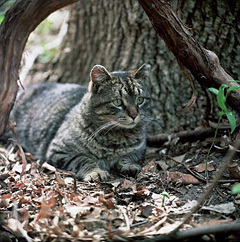 Defining and predicting feral cat behavior can be somewhat murky territory. If a domesticated, friendly cat becomes lost and has to fend for himself for a while, he could temporarily revert to some instinctively wild behavior. Some older feral cats can become fairly tame in time, yet other ferals, even when trapped as young as four months of age, may remain feral forever. Some ferals bond with their original caretaker but may never bond with a new person. During my many years of working with feral cats, I have experienced a wide range of situations with hundreds of ferals. I've seen them in a wide variety of circumstances -in my home, at the veterinary clinic, in city alleys, and in the ACR office with the ferals we often keep till we can find barn homes for them. The only conclusion one can reach from these experiences is that no two feral cats are alike and one can never predict how any feral cat will react to human contact. Just be wary of them, and use the proper equipment. A cat bite can be painful to humans, and mean probable death for the cat, as many agencies will insist on killing the cat to test for rabies. Do not keep an adult feral cat in your home if he is obviously unhappy. Some will stop eating and this can lead to serious health problems. Those cats will be better off outside, back with their colony. But do get your feral cat colony under control. When people complain about feral cats, it's usually because they have not been fixed. Males and females make a lot of noise calling for mates. Male Tomcats spray pungent urine over porches and in gardens. Sickly kittens wander around, some with swollen eyes from eye infections. Some are even blind. Sterilization stops all these problems. In March of 2007, Alley Cat Rescue helped organize the first high-volume spay/neuter clinic in Puerto Vallarta. Around 100 animals were "fixed" at this clinic. Today, the feral cat colonies in Puerto Vallarta are healthier and the neighborhood can enjoy watching and feeding them.